This rare material is not a wood species in its own right, but comes from wood that sank into bogs many centuries ago and has undergone various processes of change in the meantime. This preserves the wood naturally and lastingly. An expressive, dark colour develops due to the tannins in the bog. The scarcity of these tree trunks today makes this material a genuine rarity. The colouring of the wood varies between brown, dark brown and black-brown. To begin with, square timbers are sawn from the few usable trunk sections and then turned out as handles. Several polishes with fine oils provide an additional seal for the surfaces and give them a silky-matt finish. Without chrome the world would forfeit a lot of its lustre. 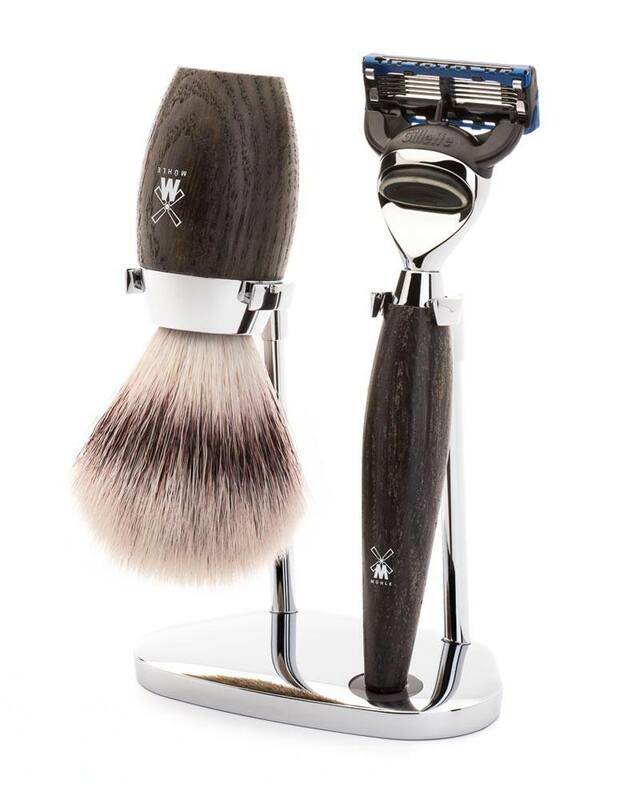 In the finish used for our wet shaving accessories it demonstrates its best qualities: The material is corrosion-resistant, very long-lasting and has a luxurious, alluring lustre. When contrasted with this, the colours and shapes of other premium materials are shown to their very best advantage. The high-quality synthetic fibres represent a world first of our own invention. We offer a synthetically produced premium quality whose material characteristics are analogous to those of the precious natural hair, silvertip badger. The majority of the users even say that this quality actually provides better performance characteristics than the natural hair. ‘Silvertip Fibre®’ is very soft at its fine tips, but somewhat more stable than natural hair in the middle section. These characteristics produce a pleasant, soft sensation on the skin when the lather is applied, without having to forgo the desired firmness of the hairs in the lathering process. In daily use, the manually processed fibres are less sensitive than natural hair as they dry more quickly and are resistant to shaving soaps and creams. The completely vegan fibres are also somewhat easier to use than natural hair as they produce a particularly creamy and thick lather from a small amount of shaving soap or cream, which is used much more sparingly as a result.